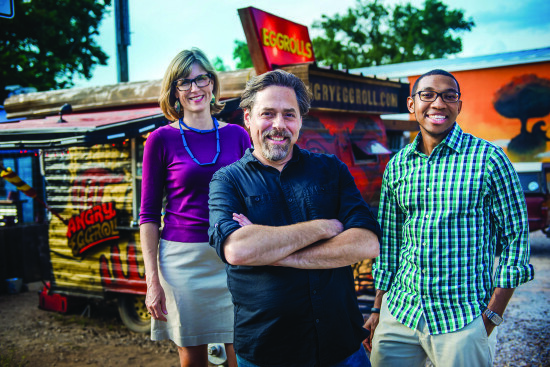 Clinical Professor Heather Way, food truck owner Stan Flukinger and alumnus Erik Combs, ’14, stand outside Angry Egg Roll on South Congress. Photos by Devaki Knowles. By offering a fresh take on sage legal advice, the Entrepreneurship and Community Development Clinic (ECDC) at The University of Texas School of Law is serving up small business legal solutions so mobile foodies can do what they do best — make delicious street food. The story starts with Clinical Professor Heather Way, director of the ECDC. She crossed paths with a food truck operator at a community event who introduced her to the Austin Food Trailer Alliance, an informal group of owners and operators. Way is always on the lookout for community groups, small businesses and potential clients for her clinic students to partner with. Legal obstacles often stand in the way of starting up a food truck, like many small businesses. 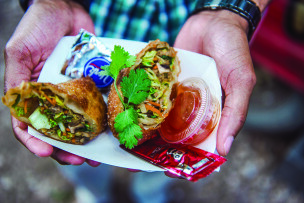 Last spring, the clinic had one food truck client, Angry Egg Roll, and it has two new food truck operators on board for the fall. The ECDC provides transactional law representation to nonprofits, community groups, low- and moderate-income clients, and entrepreneurs with business, real estate and intellectual property law needs. Students work in teams of two (under attorney supervision) with three to four clients a semester and dive into work the first few weeks of class. Mobile food establishments are subject to the same food and safety rules as their brick-and-mortar counterparts, plus some. There are ordinances and code requirements to abide by in Austin, but the city has been progressive, Way said. She added that laws have changed in great ways to accommodate vendors. Mobile kitchens date back to the chuck wagons of the 1860s, invented by a Texan rancher, of course, named Charles Goodnight. The food suited the needs of cowboys: hearty and easy to preserve — beans, coffee, salted meats. There were also the roving “Chili Queens” of San Antonio about that same time, serving up pots of food in open-air mercados. Austin’s food truck culture was born in 2006 with credit typically going to modern-day pioneers, Flip Happy Crepes. The two friends who operated the business, which closed in 2013, cooked crepes out of a vintage Avion trailer near Barton Springs Road. Could this national trend have an eminent end? Not likely said Tony Yamanaka, who started the Austin Food Trailer Alliance in 2012 and runs the website foodtrailersaustin.com. He is also one of the partners in Trailer Food Tuesdays at the Long Center, a once monthly curated meetup of the finest in Austin’s mobile cuisine. In September, the City of Austin’s Environmental Health Services Division had 1,463 active permits for food trucks in Austin and surrounding county areas. Food trucks have materialized everywhere and the operators are running into legal obstacles. The top three being: leases, trademarks and employment. The size of the small businesses and scope of their legal needs mean a team of clinic students can resolve a client’s needs in one semester, the average duration students stay in one clinic at Texas Law, Way said. There are also advanced clinic students, such as Samantha Blons, ’14, who, along with a partner, organized a lease workshop for the Austin Food Trailer Alliance in the fall of 2013 in an unlikely location for a legal clinic: a bar. At the meeting she defined terms often found in leases, types of important provisions to understand, red flags and offered insight from interviews she did with operators in varying stages of business on topics such as lease negotiation. Her team developed a flyer that can be handed out at future alliance meetings as well. Blons already knew she wanted to pursue a career in corporate law when she signed up for the clinic. She is an associate in Baker Botts LLP’s Houston office in the corporate department. When Way and her ECDC students presented at an alliance meeting, Stan Flukinger, owner of the food truck Angry Egg Roll, sat in the audience. For Flukinger, the opportunity to receive pro bono legal advice was too good to pass up. “Legal help was on a list of 18,000 things I needed to do on a paper thin budget,” he said. Flukinger’s biggest concerns were trademarking his business name and logo, protecting the secrecy of his recipes and hiring an employee. His trailer doesn’t have a menu (but it has a tip jar) because he only makes two egg rolls: meat and no meat. Erik Combs, ’14, and partner Kristen Monkhouse, ’14, were assigned to Flukinger’s case as students in the ECDC. They met at clinic orientation. Angry Egg Roll features two menu items: meat, no meat. Not to mention, Combs likes egg rolls. Combs and Monkhouse counseled Flukinger on employment laws governing small business employers and assembled a binder addressing a range of legal compliance issues. They developed a confidentiality agreement to protect his recipes, drafted a work-for-hire agreement for his logo artists and filed a federal trademark application for the business. Flukinger is originally from New York City and Brooklyn. His family moved to New Orleans six months before Hurricane Katrina, after which he briefly moved back to New York before deciding to relocate to Austin in 2006. He has had many professions, and mostly high-pressure positions including bartending at busy downtown bars and selling medical devices to brain surgeons, he said. Before starting Angry Egg Roll, he worked for a nonprofit as a technology director, but was laid off last year. His life, like his egg rolls, is full of flavor and more than anything, Flukinger just wants his egg rolls to exist. Flukinger searched the South for the hulk-style Cantonese egg rolls, bursting with meat and veggies remembered from his youth, but to no avail. With some previous restaurant experience under his belt and encouragement from a restaurant owner, friends and family, Flukinger decided to start small (in terms of kitchen size, not egg roll size — his crispy, fried rolls are huge). He imports the egg noodle wrappers, chops carrots, mushrooms, cilantro, bamboo shoots, garlic and caramelized-garlic roasted cashews or pork and packs it tight into his signature roll before frying and serving with sweet chili dipping sauce and a bite-size York Peppermint Pattie. Flukinger’s belief in his product is unwavering and his passion for his startup is contagious. The clinic’s work paid off when Flukinger was able to open a second food cart on “The Drag” near campus. “To watch the second trailer go up while we were working with him; to see his sign and know we entered the application for it … it was a big deal and a great feeling,” Combs said. Flukinger said the help he received from the ECDC was “fantastic.” He asked Combs to stay in touch, shook his hand and said that maybe some day he’d be able to pay him after Combs starts working as an associate this fall at Pirkey Barber PLLC in Austin in trademark law.